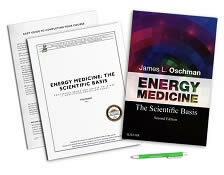 Do you have the Energy Medicine The Scientific Basis textbook? See your enrollment options above for "I already own the text". This course presents scientific evidence that’s relevant to massage therapists and bodyworkers who want to clearly understand and communicate the energetic effects of their work. The textbook author is a distinguished cell biologist and a world authority on energy and complementary medicine. This course does not teach hands-on skills. Please seek additional experience, with a mentor, to add hands-on skills. The book was a challenging read. I will re-read it 1 or 2 more times to fully integrate the information. What I read was very validating to me as a person who does acupressure and Reiki as well as massage. I also do Myofacial work and loved expanding my understanding of connective tissue. It was really exciting to see how much scientific research there is relating to bodywork. Wonderful subject matter! Oschmann's book is fabulous! This course exceeded my expectations in providing solid scientific research for a topic that I was previously skeptical of. The things I've learned have already dramatically changed my approach to bodywork, and my clients have felt a remarkable difference in the effectiveness of our sessions. This course really got my attention and the scientific base was refreshing thanks! This was my favorite course and explained to me why healing hands is my favorite massage modality. I loved this book. So much great information. As an energy worker, it helps to have your work substantiated. I particularly liked that I actually received a book to study from. I don't like reading on-line and being able to carry a book with me was very helpful. The tactile component helps me retain things better. And because I have this book, I can source it when I need to. This course was overall excellent...thank you so much! I would love to see more courses on this subject. Absolutely fascinating and so very much needed. Thanks! I absolutely love this continuing education course! I now have a method and form to use with what I already know and feel from experience. The course gave me the tools needed to communicate with medical professions on a scientific level, how energetic modalities work. I found the course ENERGY MEDICINE/THE SCIENTIFIC BASIS very interesting and validating to my work. I found myself getting excited about what I really do with my clients. Energy work is far more profound than I ever realized. The author, James L. Oschman tackled a huge job in compiling the history and current findings on biomagnetic energy in the body, how to measure it, how it corresponds to health, and the changes that a therapist can make in the body by dealing with this energy. It was a very scientific treatise on the subject, interesting, somewhat dry, as a research paper goes, has an enormous bibliography for further study if one is so inclined. I recommend the course highly. One warning: the book is not a fast read. 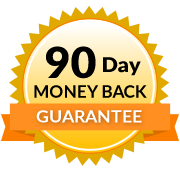 Don't expect to take this course in a weekend to get some fast CEU's. I really liked the course. As a bodyworker and licensed acupuncturist, it really helped me link the two disciplines through language. It has helped improve client communication and education, and resulted in enchanced client complince. Kim Waldeck, Dipl. AC., L.AC., L.MST. Very interesting book, kept me wanting to read more into this topic. Learned so much from this course, thank you. A fascinating, challenging tour de force. The class was well described in your material and exceeded my expectations of the course. This was my first course through you and I will definitely take future courses with you. This was one of my favorite courses to date - in all the courses I have taken. The book was facinating and presented in a manner that was comprehensible to a non-scientist. I just LOVED it. I'm wondering if there is some type of follow up course available. I'll have to look, but GREAT course. 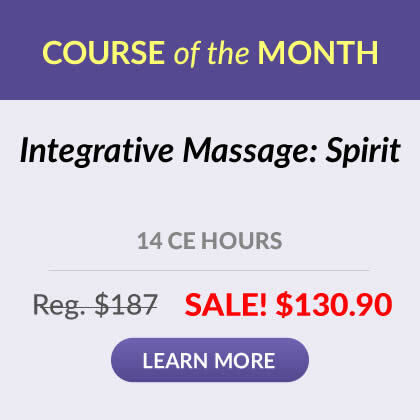 This was a great course, especially for someone who hasn't had much previous interest in "energy medicine." I found it very informational and full of interesting facts (which I love to read about). Highly recommended course for anyone in the bodywork field and probably a great refresher for anyone in energy medicine or other holistic medicine practices. Whew! Very informative course, and it reads like a textbook, but man I had to take frequent breaks or I just couldn't mentally focus on it. Likely nothing wrong with the course, just my short attention span. I like that this course takes the woowooo out of energy work, so that I could educate the public to take this more seriously instead of automatically dismissing the subject. Excellent course, dramatically important information for people like myself whose work bridges the fields of science and human energy systems. Dr. Oschman lends scientific validity to "energetic work" and "healing" through his review and explanation of research in this area. Of particular interest was the section on "electromagnetic allergy. Wow! This information was life-changing. My entire life, as well as my practice, will not be the same from here on out. Very informative thank you for making this program affordable as well. Course was comprehensive but technical. Nice to see energy medicine recongnized. Added to my understanding of energy. Wow! This course was not at all what I expected. I wasnt anticipating the intensity and definitely wouldn't have bought it had I known. So I am really glad that I didn't - I really enjoyed it! The content was SO INTERESTING! It is just what I didn't know I wanted - a lot of the things I have wondered and had theories about. I havent had any science classes for a few years but in the end I did appreciate/respect the fact that it was written with scientific terminology! Great Class Thank You! Thank you - not only was the content interesting but the exam was well done and thought provoking. I love this book. It is the reason I chose to do coursework with the Institute this year. Thank you for offering this course. The info is not new per se but it is the cutting edge of understanding and the critical shift necessary for healthcare and all levels of well-being. This understanding is the shift in awareness that can transform the failings of Western culture and reduce our suffering and the suffering we impose on the whole creation through ignorance and denial. You need an appreciation of physics and electronics and a love of pure science to really profit from the research presented but it is an illuminating compendium of historical and political interference regarding the truth of the electromagnetic nature of everything in the world as we know it, perceived for thousands of years by many who might be termed "sensitives" in this modern day. Very validating for "energy workers" in terms of the science behind what they know through other underappreciated forms of human intelligence. Excellent course! Fascinating! I intend to return to the material and cross-resource with other material pertinent to this information. This course is technical but so fascinating! I would recommend this course to anyone that is interested in energy healing. You can begin to understand how the body responds to energy in the world, human contact and even crystals. Excellent! Incredible course! Very scientific! So happy to see this information available after 30 years of massage therapy. Thank you! Recognize at least three (3) ways human energy is detected and measured. Describe at least two (2) ways energy functions in the human being. Define the terms matrix, signaling, and meridians and identify how they relate to energy in the human body. Describe the validity and benefits of polarity, therapeutic touch and magnet therapy, and identify significant related scientific research. Define "silent pulses", give examples of how they occur and how they affect humans. Describe the validity and benefits of therapeutic entrainment and identify significant related scientific research. Describe the validity and benefits of vibrational medicines and identify significant related scientific research. Describe the validity and benefits of homeopathy and identify significant related scientific research. Define the terms tensegrity and plasticity and describe how they affect human emotions and physical structure. Recognize how energy relates to and affects structural integration, joint alignment and release of toxins. Define and describe the electromagnetic environment and identify examples of electromagnetic energy in therapeutic applications. Describe how the electromagnetic environment interacts with and affects the human being. "The historical background presented in Chapter 1 explains why the various energetic therapies have received little attention from Western biomedicine. The main intellectual issue is the long-standing contention over 'vitalism vs mechanism'. Chapter 2 described how biomagnetic fields have been detected in the spaces around the body. Mention was made of the laws of physics that state that when charges flow, magnetic fields are created in the surrounding spaces.